Rodney Hunt has been working on cars for as long as he can remember. The father and grandfather recently re-opened his business, Hunt’s Auto Sales and Service Center, at 2061 Ohio 4, south of Bucyrus. Hunt made the decision to break out on his own in October 2008 when he opened Hot Rod’s AutoService on Washington Square before moving to his current location in October 2013. Hunt said Hunt’s Auto Sales and Service offers complete auto repair including diagnostics, oil changes, tires, brakes, batteries, tune-ups and detailing along with the body shop. “We offer affordable prices for our customers and have the cheapest labor rates in town,” Hunt said. A grand opening of the newly renovated business was held in October at the building that once housed Lillo’s Carpet and later, Houpt’s Carpet. For more information about Hunt’s Auto Sales and Service, call 419-562-2262. The business is open from 8 a.m. to 5 p.m. Monday through Friday. 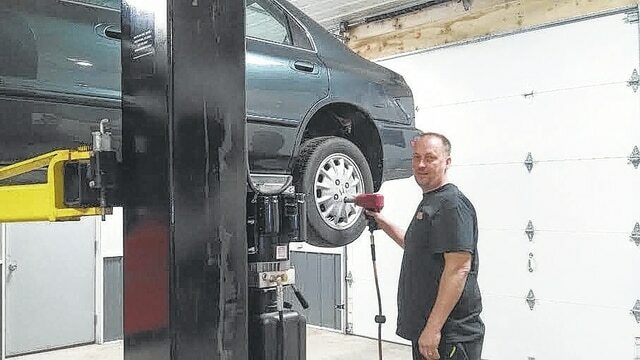 Rodney Hunt recently re-opened his body shop, Hunt’s Auto Sales and Service Center, at 2061 Ohio 4, north of Bucyrus. http://aimmedianetwork.com/wp-content/uploads/sites/38/2016/01/web1_unnamed-1-.jpgRodney Hunt recently re-opened his body shop, Hunt’s Auto Sales and Service Center, at 2061 Ohio 4, north of Bucyrus.